Williams, Patricia. "John Diefenbaker". The Canadian Encyclopedia, 14 December 2018, Historica Canada. https://www.thecanadianencyclopedia.ca/en/article/john-diefenbaker. Accessed 18 April 2019. John George Diefenbaker, prime minister 1957–63, lawyer, politician (born 18 September 1895 in Neustadt, ON; died 16 August 1979 in Ottawa, ON). 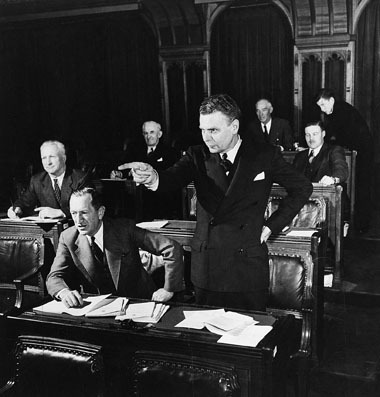 John G. Diefenbaker MP, speaking in the House of Commons in 1948 (photo by Louis Jacques, courtesy Library and Archives Canada/C-080883). John George Diefenbaker, prime minister 1957–63, lawyer, politician (born 18 September 1895 in Neustadt, ON; died 16 August 1979 in Ottawa, ON). Well known as a defence lawyer before his election to Parliament, Canada's 13th prime minister was an eloquent spokesman for "non-establishment" Canada both as a lawyer and as a politician. A supporter of civil rights for all, Diefenbaker championed the Canadian Bill of Rights and the extension of the vote to First Nations; he also played an important role in the anti-apartheid statement that led to South Africa’s departure from the Commonwealth in 1961. A charismatic and popular speaker, Diefenbaker could also be a divisive force within the Progressive Conservative Party. Moreover, he has been criticized for his indecision concerning nuclear missiles on Canadian soil (as well as strained relations with American President John F. Kennedy) and for his cancellation of the Avro Arrow project. In 1903, Diefenbaker and his family moved to the Fort Carlton region of what is now Saskatchewan and attended schools in several Prairie communities before moving to Saskatoon in 1910. He attended the University of Saskatchewan and, after serving in the army during the First World War, completed his law degree and articles and was called to the Saskatchewan Bar in 1919. His first law office was in Wakaw, Saskatchewan, but he moved to the larger northern centre of Prince Albert in 1924. Diefenbaker's path to the prime minister's office was long. 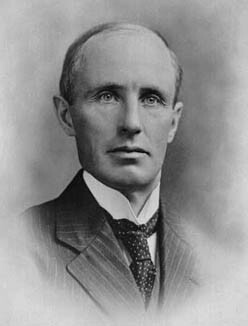 He ran federally for Prince Albert in 1925 and 1926; provincially in 1929 and 1938; and for mayor of Prince Albert in 1933. He lost each time. Despite a growing reputation as an able defence lawyer (Diefenbaker was named King's Counsel in 1929), he held firmly to the belief that his future lay in politics. 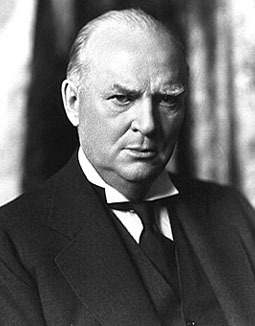 In 1936, he became leader of the Saskatchewan Conservative Party, only to preside over the party's defeat in the 1938 election when they won no seats. He continued to preach his own brand of Conservative politics, visiting many Saskatchewan communities with his wife, Edna Mae Brower, building party organization and exhorting his colleagues to "keep the faith." In June 1939, Diefenbaker was nominated for the federal riding of Lake Centre and in March 1940 he was elected Conservative Member of Parliament. The skills he had refined during his legal career served him well on the Opposition backbenches. He gained a reputation as an astute questioner of government actions, a reputation that went far beyond the boundaries of his constituency. He was re-elected for Lake Centre in 1945 and 1949, but suffered a great personal loss in 1951 when his wife died of acute leukemia. 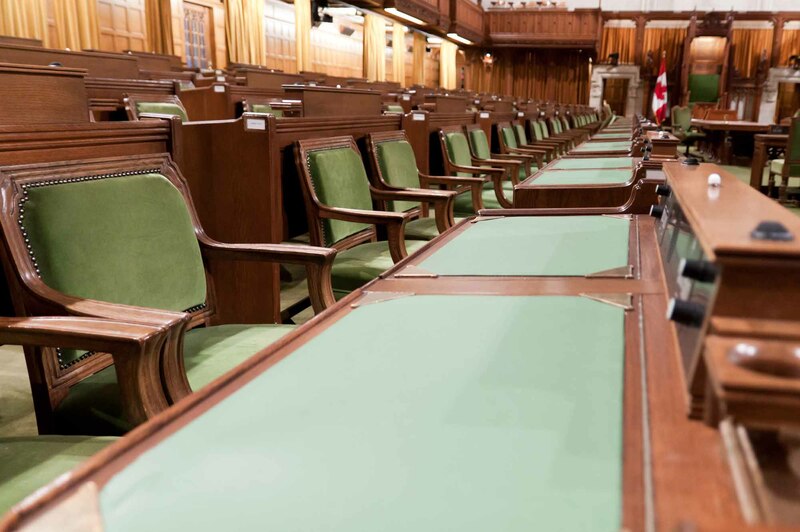 Liberal government redistributed parliamentary seats, effectively adding potential Liberal and Co-operative Commonwealth Federation (CCF) supporters to Diefenbaker’s riding. This led to his nomination as the Progressive Conservative candidate for Prince Albert in the 1953 election. The campaign and its slogan, "Not a partisan cry, but a national need," captured the imagination of Prince Albert voters and Diefenbaker was elected. That same year he married Olive Freeman Palmer, who gave up her own highly successful career in the Ontario Department of Education. Olive Diefenbaker was closely associated with her husband's political career for the rest of her life. In 1956, Diefenbaker was chosen to succeed George Drew, who had resigned as leader of the Progressive Conservative Party. The following year, Diefenbaker led his party to an upset victory over the Liberals led by Louis Saint-Laurent, and formed a minority government, the first Conservative government since that of R.B. Bennett. Backed by a Cabinet that included Davie Fulton, Donald Fleming, George Hees, G.R. Pearkes, Douglas Harkness, Ellen Fairclough, Léon Balcer and Gordon Churchill, Diefenbaker consolidated his position in March 1958 when the electorate returned his government with a huge majority of 208 seats — the highest number held by a single party in Canada to that time. The Diefenbaker era featured the personality and the style of the "man from Prince Albert"; several things now taken for granted were initiated during his administration. Wheat sales to China and agricultural reform revitalized western agriculture. His determination to guarantee civil rights for all led in 1960 to the Canadian Bill of Rights and to extending the federal vote to First Nations peoples in Canada (prior to that point, the Indian Act generally required First Nations to give up their treaty rights in order to be “enfranchised”). Diefenbaker also nominated James Gladstone, a member of the Blood nation in Alberta, who became the first Aboriginal member of the Senate. In addition, he appointed Canada’s first female Cabinet minister, Ellen Fairclough. Under the philosophical umbrella of "social justice," the Diefenbaker government restructured programs to provide aid to those in need. In addition to the Agricultural Rehabilitation and Development Act (1961), his government also established a Royal Commission on Health Services (1961) as well as the National Productivity Council (1963) — later named the Economic Council of Canada. The "northern vision" that figured so prominently in the rhetoric of the 1957 and 1958 elections increased public awareness of the Far North and led to some economic development in that region. A tour of the Commonwealth in 1958 reinforced Diefenbaker's belief in the value of that organization and other international bodies. It also helped to define his role as a supporter of the non-white Commonwealth; Diefenbaker played a key role in the 1961 anti-apartheid statement that contributed to South Africa's withdrawal from the Commonwealth. During the 1962 election, the Liberals exploited the economic crisis (the Canadian dollar had dropped to 92.5 cents US), the controversial 1959 cancellation of the Avro Arrow, and the debate over nuclear weapons on Canadian soil, including charges against Diefenbaker of anti-Americanism (see Bomarc Missile Crisis); the Conservative government was reduced to a minority. In another election the following year, the Liberals returned to power, even though Diefenbaker, travelling the country by train, almost won the election for his party in what was possibly the most spectacular one-man political campaign in Canadian history. As leader of the Opposition, Diefenbaker delighted in questioning Prime Minister Lester Pearson's government to such an extent that the House's business slowed considerably. He also argued vigorously (if unsuccessfully) against Pearson's proposal for a new Canadian flag in 1964 (see Flag Debate) and led the attack on the Liberals during the scandals of 1965. In turn, the Liberals criticized Diefenbaker for his role in the Munsinger Affair. Despite the electoral setbacks and a party deeply split over the question of his continuing leadership, Diefenbaker refused to resign and put up a spirited defence at the 1967 leadership convention, which chose Robert Stanfield as the new leader. Diefenbaker remained in politics under Stanfield and later Joe Clark; in May 1979, he won a seat for the 13th time but died only a few months later. Thousands of mourners paid their respects during the elaborate funeral (all planned by Diefenbaker himself), which included a state funeral in Ottawa, a final train journey across Canada, and burial in Saskatoon beside the Right Honourable John G. Diefenbaker Centre at the University of Saskatchewan. John G. Diefenbaker, One Canada: memoirs of the Right Honourable John G. Diefenbaker (1975); Arthur Slade, John Diefenbaker (2001); Denis Smith, Rogue Tory: The Life and Legend of John G. Diefenbaker (1995, 2013). Diefenbaker makes his flag choicesView a 1964 speech by former Opposition leader John Diefenbaker in favour of retaining the Red Ensign as Canada’s national flag. From the CBC Digital Archives. Elections of 1957 and 1958An illustrated history of the federal elections of 1957 and 1958. From the Diefenbaker Canada Centre. 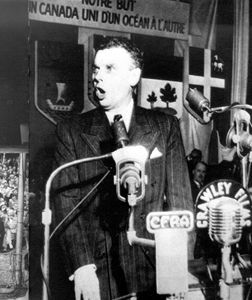 John Diefenbaker's 1957 minority miracleA CBC TV report showing how residents of Prince Albert, Saskatchewan, reacted to John Diefenbaker's 1957 election victory.